Nouriel Roubini warned the world one year ago that gold was very likely in a bubble at just below $1200. Gold prices, you will have noticed, have been rising sharply, breaching the $1,000 (U.S.) barrier and, in recent weeks, rising toward $1,200 an ounce and above. “Gold bugs” argue that the price could top $2,000. But the recent price surge looks suspiciously like a bubble, with the increase only partly justified by economic fundamentals. But, since gold has no intrinsic value, there are significant risks of a downward correction. There seems to be a world-wide Roubini bubble. All his cautions are justified because in a bull market any asset class may be overbought and enthusiasm will temporarily wane. But it remains a long-term bull market for gold because there is already inflation, quite the opposite of what Roubini claims: Food, energy, and real estate (at least in Canada) are on the rise because of the “liquidity”. A “massive wave of liquidity” is a sudden excessive supply of money itself, which is another way of saying “inflation”. Roubini is misguided about the meaning of “intrinsic value”. 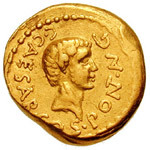 Gold is and has been, throughout human history, the very essence of intrinsic value; gold has never needed anything to back it, but has been used to back other kinds of money, and it maintains its value better than many other asset classes. He is mocking us all and seeing if anyone out there will believe him. Ha ha, very funny Mr. Roubini. Gold truly has very little, almost no, “intrinsic value”. It isn’t used in daily life; you can’t eat it, burn it, wear it to stay warm and dry, build a shelter from it, or even make much in the way of tools with it. (Though it is handy in the manufacture of electronics and a few esoteric processes.) Historically gold’s value comes from its malleability and lustre as well as its ease of refinement and relative scarcity. Whatever value we invest in gold is mainly esthetic and traditional… and thus subject to change by whim and fad. At a grand an ounce, and with the world economic situation gradually improving, I don’t see the current fad lasting much longer. Anton P. Nym: Your view of “intrinsic value” is far too utilitarian. Roubini is an extremist who’s gone off the deep end on this point. Gold has no intrinsic value? Give me a break. Well, with gold at over $1370 a year later, I suppose Roubini is still waiting for the gold bubble to pop. Don’t get your hopes up Prof. Roubini! 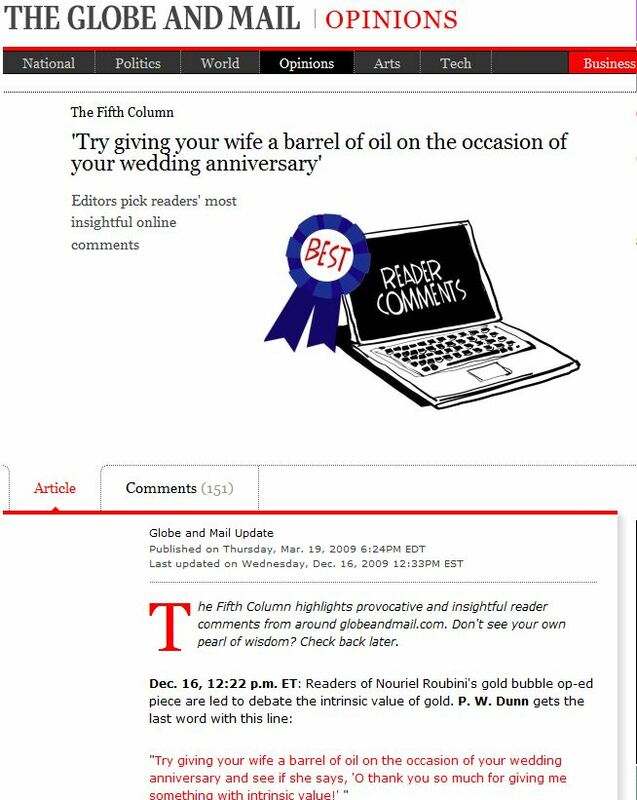 I guess the opinion editor thought that my rebuttal of Roubini and his ilk was witty (page no longer available at the globe, here is a screen snip). Your comment is indeed the best for the topic! On our wedding anniversary, I stopped buying gold years ago because the gifts end up in the safe. Useless in my opinion. However, for investment purposes, I prefer Silver as it is also an industrial metal on top of the common characteristics it share with Gold. So far this year, Silver blew Gold away in terms of performance! I think my wife is allergic to silver. Thanks Misc. But I can’t find the the Fifth Column page as it appeared on Dec 16, 2009. Cheers.